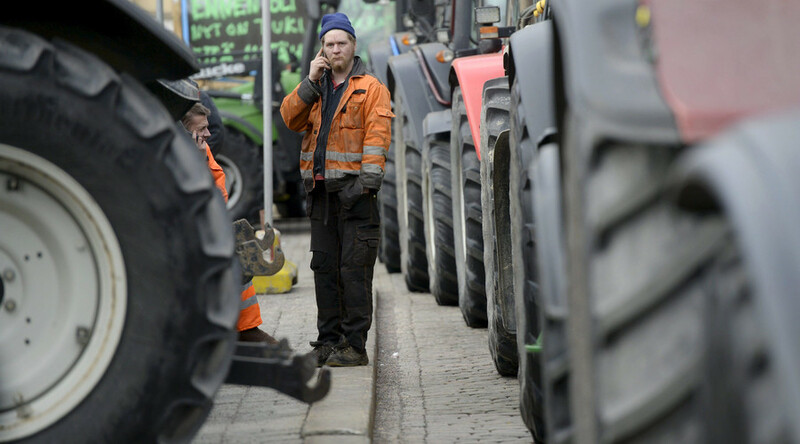 Hundreds of tractors disrupted traffic in the Finnish capital on Friday, when thousands of farmers arrived in Helsinki to protest the catastrophic situation in the agricultural sector and ongoing sanctions against Russia. Finland’s agricultural industry is in financial distress, and farmers lost two-fifths of their income in 2015. 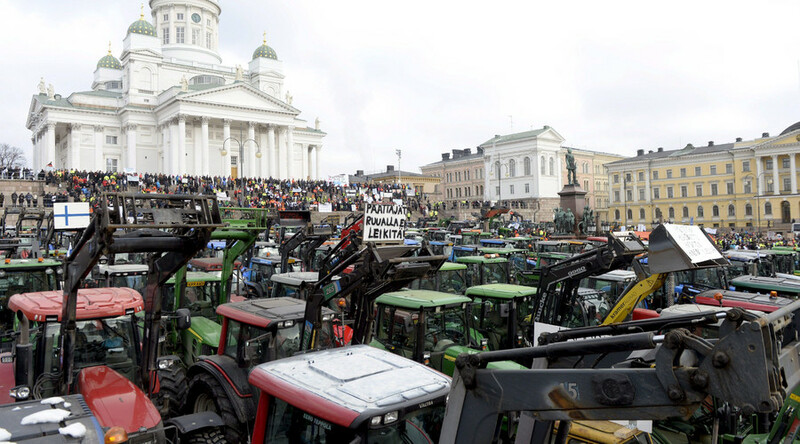 The national agricultural sector union MTK wanted to make sure the message was well-heard at the very top, and members of the organization drove an estimated 600 tractors to the Finnish capital’s downtown Senate Square early on the morning of March 11. 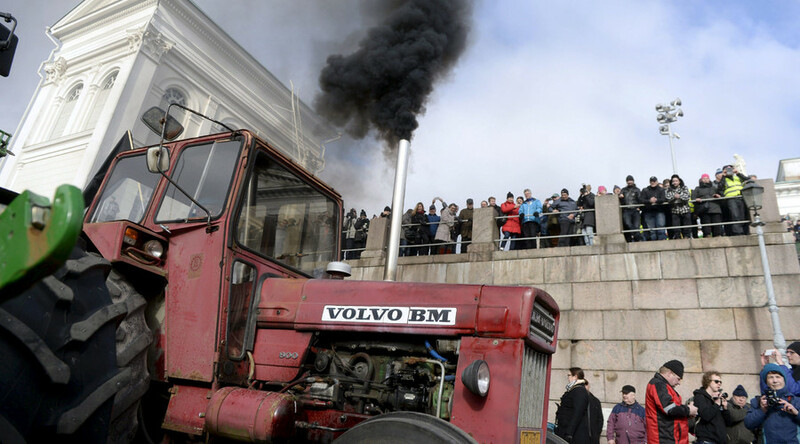 The number of participants was estimated at 3,000, with some of the farmers reportedly driving their tractors hundreds of kilometers across the country to reach the capital and take part in the protest rally. 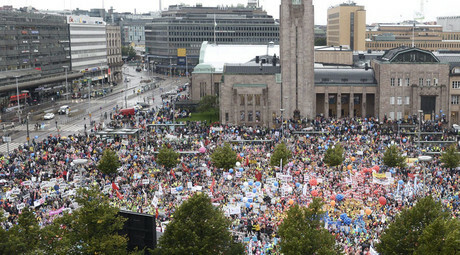 Similar rallies were reportedly organized in other Finnish cities, although on a smaller scale. EU economic sanctions against Russia, backed by Helsinki, were named by the MTK as the main reason for Finnish agricultural goods being depreciated. Russia has been the key market for Finnish farmers for the last two decades and joining the EU sanctions against Moscow in 2014 became a “shot in the foot” for the Finnish farming industry. What’s more, Finnish farmers have endured severe delays in receiving aid, seen as last-resort assistance from the EU, reports Yle Uutiset. The Helsinki demonstration of farmers and their supporters lasted from 9am until at least 3pm, and caused severe traffic jams as tractors arrived to the rally and later when they were leaving the capital. According to estimates by Finland’s Natural Resources Institute (LUKE), last year farmers’ incomes shrank by 40 percent, if compared to 2014, with the average farm’s losses estimated at nearly €10,000 (US$11,500). The worst stats were registered in the dairy industry, which dragged down the income of the entire national agricultural sector.